Families need to make an effort to get updated portraits every year! Easy to say coming from a photo studio, right?! Think about it: the changes your family goes through in a year are huge. The kids grow and change so much. We see a lot of families come through our studios this time of year, capturing those memories that are sure to change in the coming months ahead. Make the most of your holiday photos by working in themes of winter and holiday favorites. Below you’ll find some of our suggestions but we can’t wait to see what you come up with to represent your kids and family! The best part about the cold weather is hands down the cozy sweaters with fuzzy hats and scarfs. 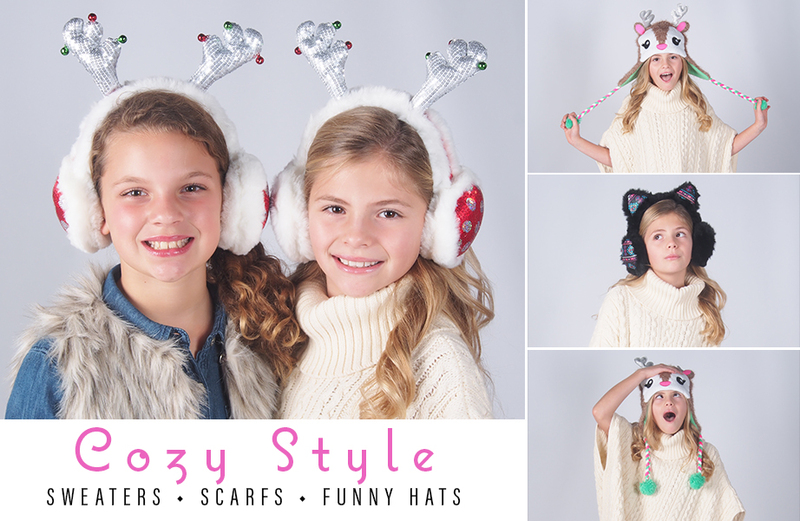 This year the winter accessories have more character than ever! We can’t get enough of fleece critter hats and gloves that feature owl faces or unicorn hoods. These portraits are full of attitude and we LOVE them! As mothers, we spend a ton on those dance outfits for Christmas recitals. The kids wear them once and the next year they no longer fit. A winter photo shoot donning dance costumes gives them another reason to dress up and an experience to remember complete with great portraits. 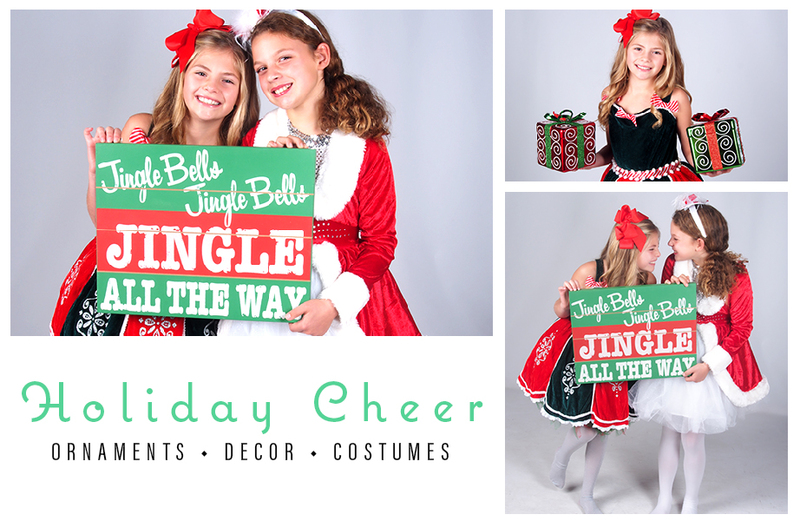 Add in over sized holiday decorations to make the session less dance recital and more winter wonderland. These props can be found at your local craft store; they are typically used for outdoor decorations but are perfect for this type of session. 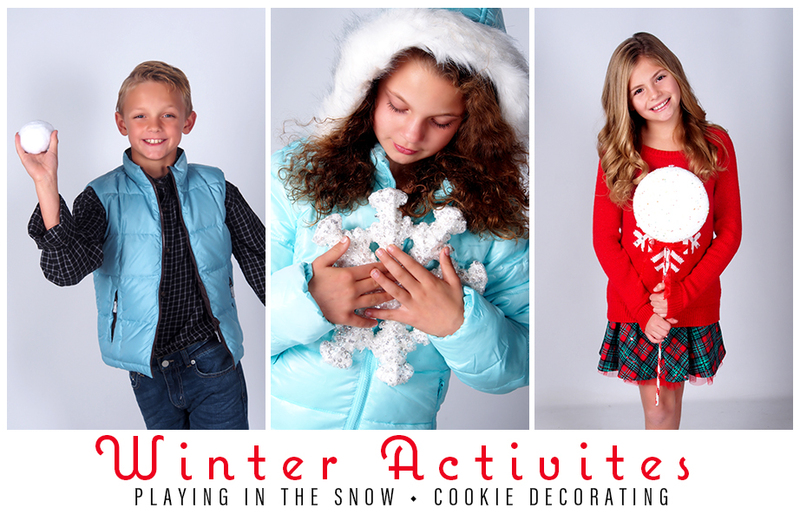 Winter activities are what childhood memories are made of! The first snowfall of the year evokes a time of rolling snowballs and building snow forts. We cared very little about the cold temperatures outside and only came in when the fresh baked cookies for Santa were ready. Incorporate those activities in your photo session with faux snow, snowflake ornaments, and holiday candies and cookies. Now, there is no excuse not to join us for a family portrait update. We’ll see you in time for the holidays!